FREE PUMP, PADDLE, LEASH, CARRY BAG & DELIVERY. Designed for distance and trekking overnight paddle trips and discovery outings, Great for flat water fun for all levels. 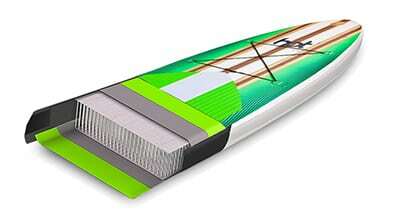 This model is also used in our hire center and our sup school. This is a double lined board which makes it far more stable and strong which means it does not flex in the water and is easier to paddle. Sleeker outline for more glide per paddle.